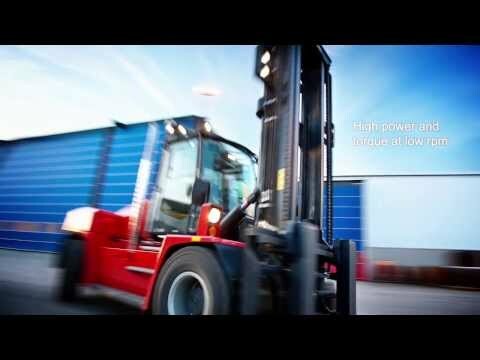 Kalmar’s G-generation forklifts feature the latest in fuel-efficient technology and offer low total cost of ownership. For demanding applications such as steel and wood handling, they provide the best possible return on investment. The DCG90–180 is designed for superior uptime, lower fuel consumption and reduced maintenance costs.DCG90-180 is avaliable with the latest generation of engines from both Volvo or Cummins. They both meet the requirments of Stage 3B/Tier4i emission standrads. The DCG90-180 is eqipped with a variable hydraulic pumps as standard. The variable pump significantly lowers the strain on the hydraulic system and allows the forklift to fully perform when its needed. This features has also proven to lower the fuel consumption of the machine but at the same time raise the performance. Since these machines are often used in the toughest of environment we have improved the cooling system of DCG90-180. A variable hydraulic fan keeps the engine and hydraulic cool even at the most extreme operations. The fan can also be reversed to clean the cooler from dust and dirt. For operators, our EGO cabin provides an outstanding driving environment, packed with features that support productivity, efficiency and safety. The curved front and rear windows give exceptional visibility at all angles, particularly diagonally, and the profiled beams eliminate blind spots. The whole interior has been designed with the driver in mind.More or less everything is adjustable to fit all kind of drivers. For example the steering wheel can be adjusted in every possible angle, it can even be tilted sideways. Operators will also benefit from a fully integrated, rotatable seat. Perfect for handling large wood stacks. The DCG90-180 is also available in a Big Wheel version suitable for rough terrain conditions. We developed Big Wheel to give you a smoother ride. Equipped with oversized front wheels, these forklifts allow you to work efficiently, and comfortably, even when surface conditions are poor. You get superb traction and can work productively in rough conditions where high ground clearance is required. The big tyres also provide excellent suspension when driving over uneven surfaces. Swedish family-owned sawmill AB Hilmer Andersson made a clear decision when it came to choosing its forklifts. Five Kalmar DCG140-6 machines offer high performance and productivity and a more comfortable environment for drivers. Kronoprinz needed to transport steel coils that can weigh up to 16,300 kg each and need to be handled with care. 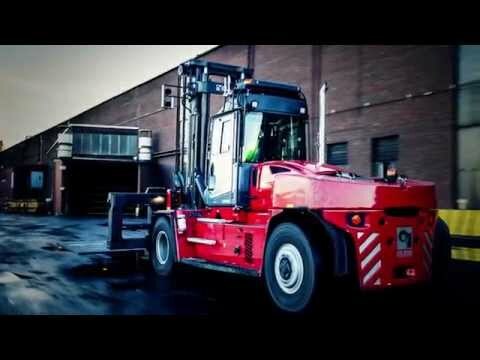 Kronprinz's 18-ton Kalmar forklift is equipped with a coil ram to carry steel coils to production lines. Tuboscope handles pipeline components up to 15 metres long, often in challenging weather conditions. Kalmar’s DCG100-12 helps them get the job done safely with a load-stabilising system, smooth handling and superb manoeuvrability.